Today marks the nine year anniversary for the US war on Iraq. A war that ruined millions of Iraqi lives, and hastened the decline of the US economy. Today, I share this poster with you commemorating all the lives that were lost from both sides. As graduation day was approaching, my dearest professor and director of visual arts, Paul Bruner, told me that he wanted to put together an art exhibition for the B.A. students. He then said “if I recommend you, can you put something up?” and without hesitation I said “yes!” It was almost finals period, and all deadlines for my design classes were very near, but I was very frustrated, and I needed to vent! This poster was the result. Note that this was almost a year before the Abu Ghraib prison scandal went public and changed the public opinion on the war. 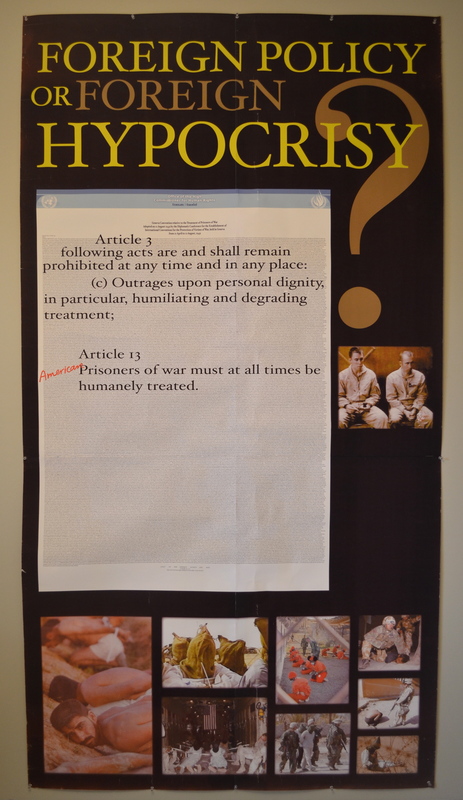 In this poster I was criticizing the biased application of the Geneva Convention, specifically article 3 and 13 that refer to the treatment of prisoners of war. While throngs of Iraqi prisoners of war were treated inhumanely to say the least, the Bush administration and the US media were threatening the Iraqis and accusing them of violating the Geneva Convention. This happened after the Iraqis released a video showing a few American soldiers who were held by Iraqis drinking tea! It was not intended to be offensive, but rather an eye opener to those who supported an illegal war about which they knew nothing. يصادف اليوم الذكرى التاسعة للحرب الأمريكية على العراق. الحرب التي دمرت حياة الملايين من العراقيين، وعجلت في إنهيار الإقتصاد الأميركي. اليوم، اشارككم هذه اللوحة إحياءً لذكرى الضحايا الذين فقدوا حياتهم من الطرفين. مع إقتراب موعد التخرج، علمت من أعز بروفيسور لدي وهو مدير قسم الفنون البصرية أنه يريد تشكيل معرض لطلاب ليسانس الأداب. عندها سألني ”لو رشحتك فهل تستطيعين أن تضعي شيئاً للعرض؟“ ومن دون تردد قلت ”نعم!“ كنا قد اقتربنا من موعد الامتحانات، ولكني كنت محبطة جداً وبحاجة للتنفيس. هذه اللوحة كانت النتيجة. أود أن ألفت انتباهكم بأن اللوحة عرضت قبل سنة من ظهور فضيحة سجن أبو غريب التي غيرت الرأي العام عن الحرب. كنت انتقد في هذه اللوحة التطبيق المتحيز لإتفاقية جنيف، بالأخص المادتين ٣ و ١٣ اللتين تشيران إلى معاملة سجناء الحرب. بينما عومل الآف من السجناء العراقيين معاملة غير إنسانية وهذا أقل ما يقال عنها، كانت إدارة بوش و وسائل الاعلام الأمريكية تهدد العراقيين وتتهمهم بانتهاك إتفاقية جنيف. كان ذلك نتيجة للفيديو الذي نشره العراقيون والذي يظهر عدة أسرى من الجنود الأميركيين يشربون الشاي! لم يكن المقصود من اللوحة الهجوم أو الإهانة، بل مجرد تثقيف لتلك الأعين التي أيدت حرباً غير مشروعة دون أن يعلموا عنها شيئاً. Its sad that after so many years this is still real and relevant. Shows you how art can speak for decades. yes, because history keeps repeating itself! It’s a powerful poster to present even now but must have been groundbreaking at the time, especially as it rubs against popular opinion. It’s a brilliant piece of art to bring the issue and highlight the hypocrisy to the mass conciousness. Human rights are important everywhere… and always. Thanks for sharing and continuing the conversation. Anytime Olga, thanks for the comment. I feel so encouraged to know that I’m not alone. When leaders lose their moral high ground > they drag their country down into the cess pit…I sincerely believe that many in the Bush administration need to be put before a war crimes tribunal. A reminder of one of the greatest crimes committed in modern times. Thanks Rasha. The Bush administration and US military apparatus committed one of the greatest crimes of our age. It seems, however, that the US has been at it for decades and shows no sign of learning its lesson. Even before the United states illegally invaded, occupied and brought destruction to Iraqi society, it dropped the only two nuclear bombs ever on Japan, ending World War 2 in the Pacific. The US-led war on Iraq was also the largest land deployment since World War 2. When responsible societies are too weak to stand up for what’s right (International Law), destructive governments have a horrid way of repeating their crimes. Nahareek Saaed,Leanova, l am glad l read your blog bothe in Arabic and english,and your thoughts about the Gulf war.I teach Arabic.Wishing you luck and success.Your success is my success,my success is your success.